This Research and Extension Experiential Learning (REEL) program is for undergraduates students who are interested in applying their education in life sciences to developing solutions to our food, fiber and fuel needs of the future. To meet these challenges, VT-REEL fellows will gain experience over 10 weeks in the summer in both basic science and in applications. This experiential learning will help VT-REEL fellows develop a career in plant science, and be prepared to bridge the existing gap between discovery and practical applications of discoveries to solve real-world problems. 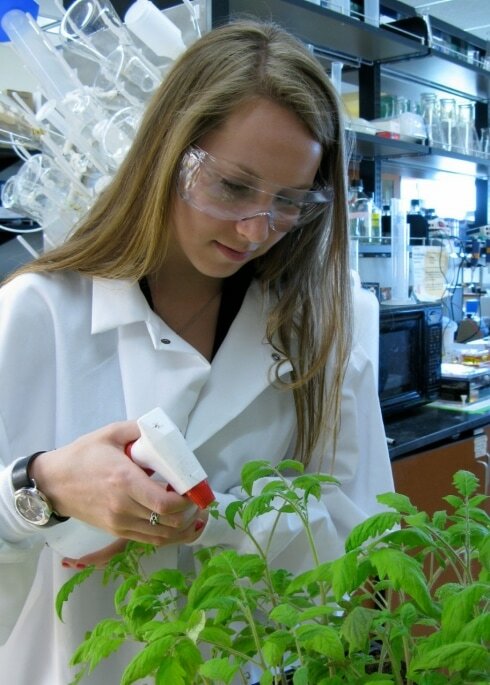 VT-REEL fellows will engage in research for the first 5 weeks of the program in a laboratory on Virginia Tech’s main campus (Blacksburg, VA), with a member of our Translational Plant Sciences program (https://translationalplantscience.org). You will live in a Virginia Tech dormitory and have a meal plan at our award winning dining halls. Fellows will work with faculty mentors, TPS graduate students, and Virginia Tech undergraduate researchers on a project designed to gain new skills. Many of the participating labs ​are interested in molecular-focused work that help delineate mechanisms plants use to combat pests and pathogens, and maintain productivity especially in times of stress. Weekly workshops will be presented by faculty and will give fellows an opportunity to explore important issues such as organic farming, regulation of transgenic plants, and genome editing approaches. During the second 5 weeks, VT-REEL fellows will work with a faculty member at one of four ARECs (Agricultural Research and Extension Centers) in Suffolk, Painter, Blackstone or Virginia Beach, VA. This portion of the summer starts off with a group trip to tour these AREC stations, which are embedded in areas that facilitate interaction between AREC faculty, extension agents, farmers and producers. VT-REEL fellows will work with an AREC faculty mentor and staff in their research, which often involves working with commodity crops in the field. In addition, VT-REEL fellows will get the chance to participate in various Extension activities such as field days and grower meetings. At the end of the summer, VT-REEL fellows will travel back to Blacksburg and present their work in Virginia Tech's Office of Undergraduate Research's annual summer research symposium. Transportation between the campus and AREC's will be provided by the program. Each VT-REEL fellow receives a $4,500 stipend, an on-campus meal plan, and housing both on-campus and at the AREC. Transportation between Blacksburg and the ARECs will be provided by the program. Students who need help with transportation costs to participate in this program are encouraged to apply, and if accepted, to speak with Dr. Glenda Gillaspy (Program Faculty Director).